The present study tested the hypothesis that lower body progressive resistance training (PRT) increases the neural drive expressed as surface electromyographical (EMG) activity in patients with multiple sclerosis (MS). The study was a randomised controlled trial (RCT) including a 12-week follow up period. 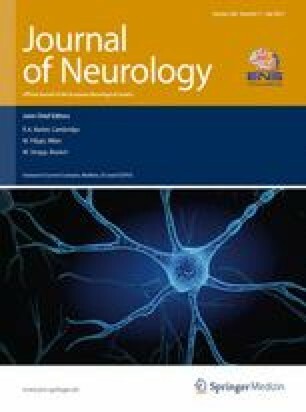 Thirty-eight MS patients were randomized to an exercise group (n = 19) or a control group (n = 19). During the intervention period, the exercise group performed a 12-week supervised lower body PRT program, whereas the control group maintained their usual daily activity level. After the 12 week intervention period, the exercise group were encouraged to continue training on their own for a 12-week follow up period, while the control group completed the 12-week supervised PRT program. Surface EMG was recorded from vastus lateralis, rectus femoris and semitendinosus during maximal isometric knee extension and knee flexion, before and after the intervention and at follow up. From the recordings, the area under the rectified, low-pass filtered EMG signal (integrated EMG, iEMG) was calculated. Muscle strength was expressed as the angular impulse (AI) and was measured during the same period as the iEMG. After PRT significant improvements for iEMG of vastus lateralis and rectus femoris during maximal knee extension and for semitendinosus during maximal knee flexion and for AI during both maximal knee extension and flexion were found in the exercise group, when compared to the control group. When compared to the post values, all effects, except for AI during knee flexion, were maintained at follow up in the exercise group. When the control group was exposed to PRT, a similar pattern of improvements were found, albeit not all improvements were significant. In conclusion twelve weeks of intense PRT of the lower extremities improved the neural drive expressed as maximal surface EMG activity in patients with MS, with effects persisting 12 weeks after the intervention. The study was registered at clinicalTrials.gov, Protocol no. NCT00381576. The authors wish to thank Vivi Brandt from The MS Clinic at Aarhus University Hospital for helping with recruiting patients, as well as the handling of logistical matters. Tue Kjølhede, PhD student at Section of Sport Science, Department of Public Health, Aarhus University, is acknowledged for his valuable comments to the manuscript. Financial support was received from the National Multiple Sclerosis Society, The Research Foundation of the MS Clinic of Southern Denmark (Vejle, Esbjerg and Soenderborg), Director Werner Richter and wife`s Grant, the Augustinus-Foundation, Engineer Bent Boegh and wife Inge Boeghs Foundation, Vilhelm Bangs Foundation, Manufacturer Mads Clausen′s Foundation, The Toyota-Foundation, Mrs. Benthine Lund′s Foundation and AP Moeller′s Foundation. None of the sponsors played a role in the study design; in the collection, analysis, and interpretation of data; in the writing of the manuscript; or in the decision to submit the paper for publication. UD has received research support, travel grants and/or teaching honorary from Biogen Idec, Merck Serono and Sanofi Aventis. ES has received research support and travel grants from Biogen Idec, Merck Serono and Bayer Schering and travel grants from Sanofi Aventis. TP has received research support and travel grants from Biogen Idec, Merck Serono, Bayer Schering and Sanofi Aventis. KO, HS, CL, CR and TIH have no disclosures.